Fire Erupts At Building In Downtown Dubai; Doesn't Interrupt Fireworks : The Two-Way A hotel near the site of Dubai's planned New Year's Eve fireworks display broke out in flames Thursday. News reports said at least 20 stories were on fire. Dubai's media office reports 16 injuries. 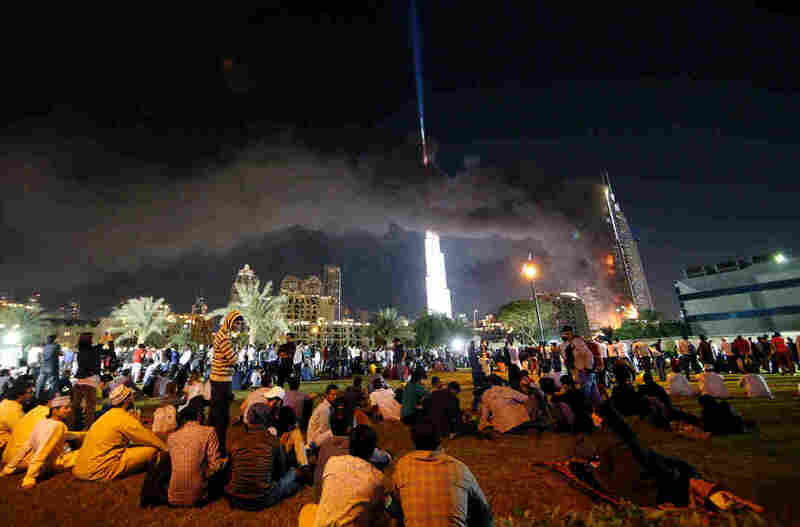 People watch the Address Downtown hotel burning on Thursday after a huge fire ripped through the luxury hotel in Dubai. A hotel in downtown Dubai erupted in flames on Thursday evening, just two hours before the city was due to celebrate New Year's Eve with a massive fireworks display. 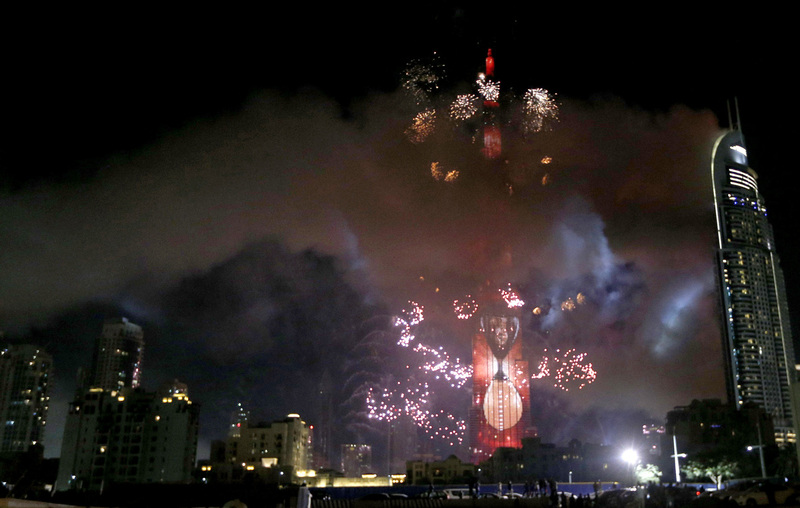 At midnight local time, the celebration proceeded as planned — resulting in a jarring double display of light and smoke, as firefighters continued to battle the blaze at one skyscraper while fireworks were sent off from the nearby Burj Khalifa. Earlier in the evening, Dubai's media office confirmed on Twitter that a fire had been reported at the Address Downtown Dubai hotel. The fire began outside the building, on the 20th floor, the media office tweeted, and firefighters worked to prevent it from spreading through the skyscraper's interior. As of 2 p.m. ET (11 p.m. local time), the media office said firefighters had control of "90 percent" of the fire. It was not immediately clear what caused the blaze, which the Associated Press reports affected at least 20 stories of the building. Burning debris was falling from the building, the AP noted. The 63-story Address Downtown Dubai building was completed in 2008 and contains 196 luxury hotel rooms and more than 600 apartments, according to its website. By some counts, it's one of the 100 tallest buildings in the world. It is in the same complex as the Burj Khalifa, the world's tallest skyscraper. Several spectators in Dubai recorded live video of the blaze on the Periscope app. The fire began shortly before 10 p.m. local time, or 1 p.m. ET. The government's media office is reporting 16 injuries, including one case of cardiac arrest. As of midnight local time (3 p.m. ET), the fire had not been completely extinguished. Smoke billows from the Address Downtown Hotel, at right, after it caught on fire hours earlier, as a fireworks display goes off near the Burj Khalifa in Dubai on Friday. The fireworks were set off from the nearby Burj Khalifa, as scheduled; smoke from the Address Downtown continued to drift across the Dubai skyline.